A further ten Western District pioneers move onto the Pioneer Obituary Index this month with some joining their family members. That is the case with the families of Lesser, Cole, Kirkwood and Learmonth. As I add entries to the index, I try to match them up with related entries and link them up. You’ll now find a number of family connections when you scroll through the index. As usual, if you click on any of the underlined text throughout this post, you will go to further information about that subject. 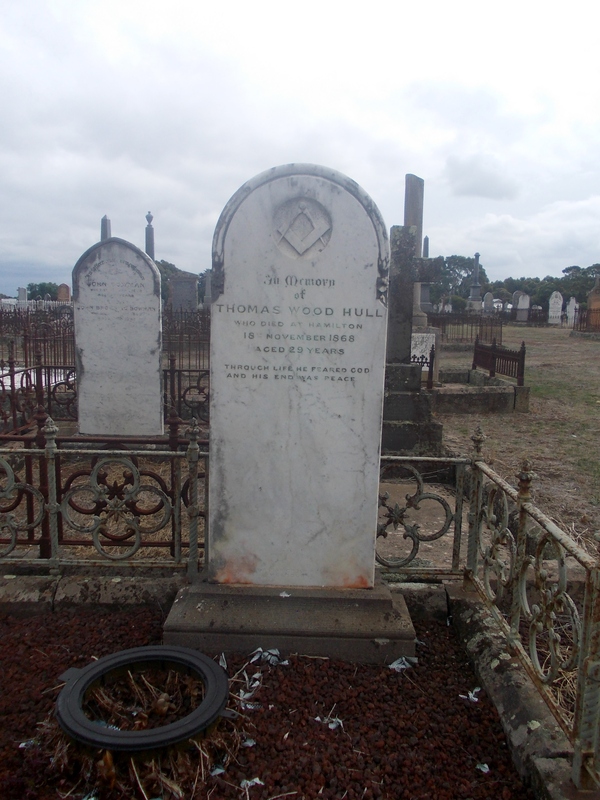 HULL, Thomas Wood – Died 20 November 1868 at Hamilton. Thomas Hull was born in Rochester, Kent, England around 1839, a son of John Hull and Elizabeth Wood. He was also a nephew of the Honorable William Hull, a member of Victoria’s Legislative Assembly from 1860 to 1866. By 1865, Thomas was in Victoria and a policeman stationed in Gippsland. In that year he received a promotion from Senior Constable to Sergeant 2nd Class. By 1867, Thomas had transferred to Hamilton. In October 1867, Hamilton’s Inspector of Police, Leopold Kabut left the town, so Thomas Hull, a promising young policeman, was put in charge of the Hamilton station. Things were also going well in his personal life and Thomas married Kate Wright of Hamilton at the Church of England on 15 July 1868. On the morning of Friday 20 November 1868, Thomas found it necessary to dismiss one of the mounted policemen Michael Flanagan. Flanagan had one too many times been reported for drunkenness. Thomas asked Flanagan to hand in his kit but advised him he could stay in his house for a couple more days due to him having a wife and six children. Thomas then went about his duties, including a patrol around the business area of Hamilton. At 2.00pm, Thomas returned to his quarters and around thirty minutes later Flanagan approached him. There was some discussion between the two about the Flanagan’s living arrangements. Flanagan then produced a pistol, asking Thomas to check if it was clean. He then approached Thomas and shot him twice in the left side. Constable Conway who had been present rushed Flanagan and grabbed hold of the pistol. Flanagan would not release his grip so Conway cried, “Murder” and the watch-house keeper ran to his aid, securing the pistol. They then put Flanagan in the lockup. Meanwhile, Thomas Hull lay on the ground with internal bleeding, slowly fading over the course of thirty minutes. Kate had heard the disturbance rushed to Thomas’ side and he recognised her presence. Thomas spent his last minutes praying, uttering, “It is hard to die”. 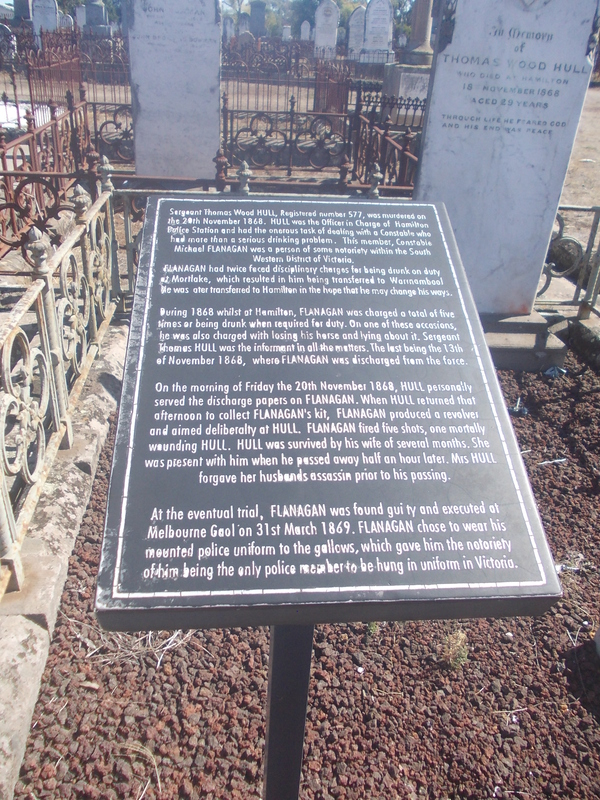 He forgave Flanagan and his enemies before the effects of his wounds took his life at just twenty-nine. He was buried at the Hamilton (Old) Cemetery. Michael Flanagan was found guilty of murder and sent to the gallows, insisting on wearing his mounted policeman’s uniform to meet his fate. Thomas’ wife Kate remarried in 1870 to another policeman, Alfred Clark. 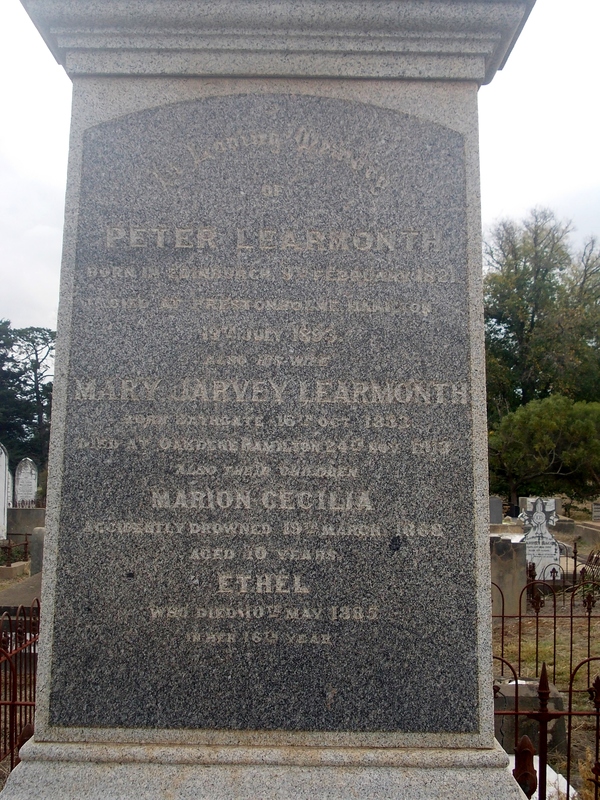 She died at the Bendoc Police Station in Gippsland in 1886 aged just thirty-six. LESSER, Abraham – Died 13 November 1886 at Coleraine. Abraham Lesser was born in Swarzędz, Poland, then under Prussian rule, around 1826. In the 1850s, his brother Louis left for Australia and Abraham followed. Together they went to Coleraine, opening a store in Whyte Street. In 1861, Abraham married Londoner Elizabeth “Bessie” May at the Mikveh Israel Melbourne Synagogue. In 1865, Abraham and Louis mutually dissolved the partnership in the store and Louis left for London where he married Bessie’s sister Evelyn May. Abraham’s wife Bessie would have several pregnancies, however, she lost her first two babies and by 1870, the Lessers had lost five babies. As well as the store, Abraham was active in the community. He was a member of the Wannon Shire Council for almost ten years and a Justice of the Peace. A generous benefactor, he donated money to churches of all denominations. On 12 November 1886, Abraham attended a concert in Coleraine. While having a chat with John Kirby who would later buy Mt Koroite at Coleraine, Abraham suddenly collapsed. He died early the following morning at the age of sixty. He left his widow Bessie and four children. The funeral cortege was one of the largest seen in Coleraine. Reverend Goldrich, rabbi of the Jewish congregation in Ballarat conducted the service. 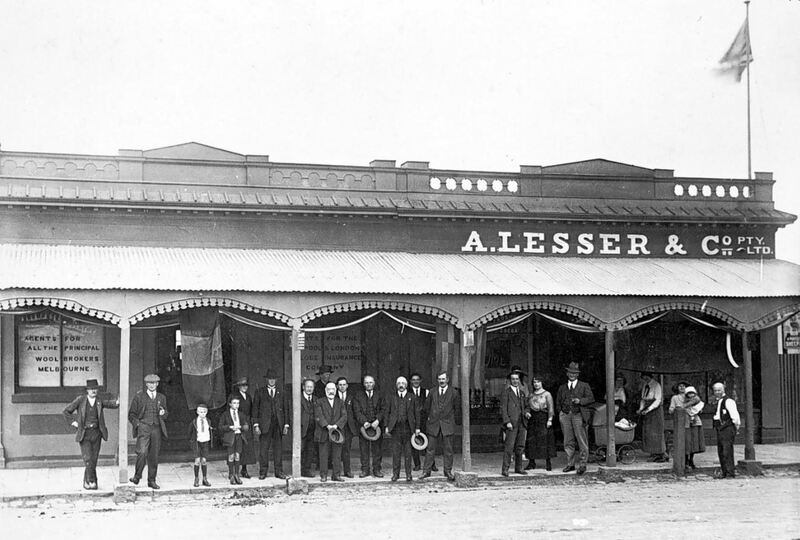 The store of A.Lesser & Co (below) continued operating in Coleraine first by Louis and then members of Abraham’s family until it went into liquidation in 1939. HORAN, Keeran – Died 17 November 1892 at Croxton East. Keeran Horan was born in King’s County, Ireland around 1824 and arrived in Victoria in the late 1850s with his wife Catherine Guinan. After spending fifteen years farming at Mount Moriac near Geelong, Keeran took up land at Croxton East in 1872, calling the property Pine Hill Farm. Keeran was an expert ploughmen and a noted breeder of draught horses. 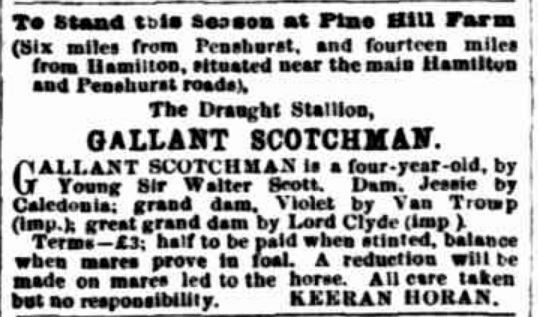 He once paid a record price for a draught stallion from Daniel Twomey of Kolor at Penshurst. “Advertising” Hamilton Spectator (Vic. : 1870 – 1918) 27 September 1884: 4 (SUPPLEMENT TO THE HAMILTON SPECTATOR). <http://nla.gov.au/nla.news-article225660511&gt;. In 1887, Keeran entered a competition conducted by the government to find the colony’s prize farm. An article about the visit of the judges to Pine Hill Farm gives a great description of not only Keeran’s farm but farming practices from the time. You can find it on the link here. At the time of Keeran’s death, he left a large family. Catherine predeceased him in 1902. 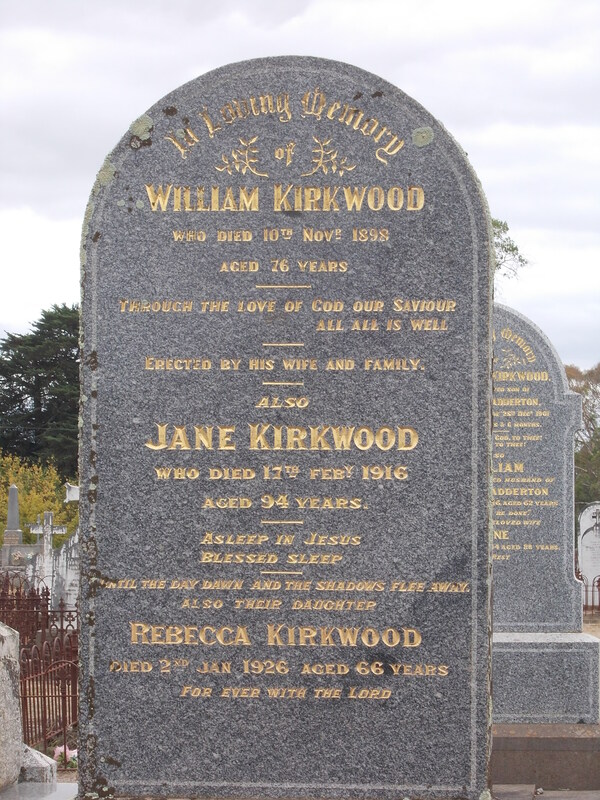 KIRKWOOD, William – Died 10 November 1898 at Buckley’s Swamp. William Kirkwood was born in Quebec, Canada on 9 February 1822. When still a child, his parents returned to Paisley, Scotland and William grew up there. In 1842, William married Jane O’May and they had one child before heading to Australia in 1852 arriving at Portland aboard the John Davis. They took a bullock dray to Warrock, north of Casterton where William worked. They later went to Park Hill at the Wannon. William then selected land south of Hamilton at Buckley’s Swamp in 1861. William and Jane went on to have another son and three daughters. William was a devout member of the Hamilton Presbyterian Church and church precentor, leading the singing until an organ was purchased. In 1883, William returned to Scotland for a visit. William’s funeral cortege left his home at Buckley’s Swamp at 1.30pm and when it reached Hamilton two hours later, the mourners following behind the hearse stretched for 800 metres. HOLLARD, George Gilbert “Giles” – Died 26 November 1912 at Wallacedale North. George Hollard was born in Devonshire, England in 1817. He married Mary Richards and they had three children. In 1849, George and his family sailed to Portland aboard the Bristol Empire. George was employed by Edward Henty at Muntham where he remained for many years. In time, he and Mary returned to Portland. Mary died in 1894 and George stayed in Portland until around 1908 when he went to live with his son at Wallacedale. One of the highlights of George’s life was seeing the Governor of Victoria, Sir George Bowen turn the first sod on the Portland-Hamilton rail line. George left three sons and four daughters at the time of his death. DUNBAR, John – Died 9 November 1913 at Hamilton. John Dunbar was born at Tyrone, Ireland around 1833 and arrived in Victoria in 1855 and made his way to Hamilton. In 1863, John married Frances Hawke and they had seven sons and four daughters. John and Frances would stay in their marital home until their deaths. In his later years, John remained fit and worked in his garden each day, only going into town on Saturday for shopping. John left his widow Frances, three sons and three daughters. Frances died at Hamilton in 1921. PEARSON, Mary Jarvey – Died 24 November 1913 at Hamilton. Mary Pearson was born in 1832 at Bathgate, Scotland, the eldest daughter of John Pearson and Mary Simpson. Mary’s grandfather Sir James Simpson who discovered the use of chloroform as an anaesthetic. When Mary was six, she left Leigh Scotland in January 1840 with her parents and siblings, to travel to Hobart, Tasmania on board the North Briton. During the voyage, the ship ran aground on the Goodwin Sands off the English coast near Kent, delaying the journey a month. Back on course, as the ship rounded the Cape of Good Hope on 30 April 1840, Mary’s mother gave birth to a son, Joseph. Once in Hobart, the family lived in Mary’s late uncle’s large house at Douglass Park, Campbell Town John had inherited. In 1846, John Pearson bought the run of Mr Robertson on the Glenelg River in Victoria. On 30 May 1846, John and Mary Pearson and their five children sailed for Portland Bay from Launceston on the Minerva with Captain Fawthrop at the helm. From there they travelled to the 10, 750 acre Retreat Run near Casterton. During their time at the station, they saw the impact of the Black Thursday bushfires on 6 February 1851 when Mary was nineteen. Such was fires intensity, birds and wildlife sought refuge at the homestead. The time of the fires would remain fixed in Mary’s memory for another reason. Her mother died two days later on 8 February 1851. Her body was transported to the Portland North Cemetery for burial. 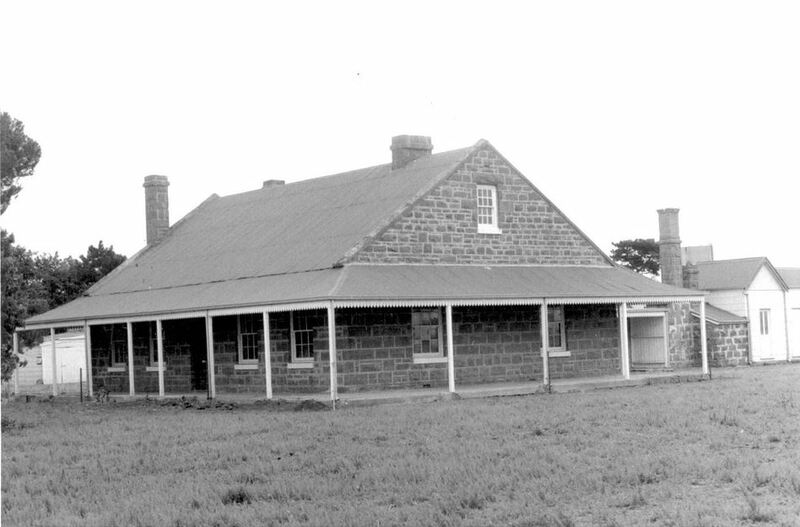 Mary’s father sold Retreat soon after, taking up Yambuk Station in July 1851. The trip to Yambuk took two days and there was a stopover at Castlemaddie at Tyrendarra, owned by Mr Suter. In March 1853, Mary was visiting Castlemaddie when three armed bushrangers entered the house during afternoon tea and demanded money from those present. Mary had a long gold chain, a gift from her father, and she tried to hide it but Wilson the bushranger caught her. “You ladies needn’t put your jewellery out of sight. I don’t want any of it. All we want is coin.”, he said. In 1854, John Pearson sold Yambuk to Mr Suter formerly of Castlemaddie and he moved to Portland. While in the Portland district, Mary met and married Peter Learmonth on 18 December 1854 at Portland. Peter had come from the Castlemaine diggings where he had some success. He took up a job at Merino Downs for the Hentys and Mary moved there with him. They then went to Hamilton where Peter set up a flour mill at Prestonholme, just east of the town. He ran other mills in the district including Byaduk. He also established P.Learmonth & Co, Stock and Station agents in Gray Street Hamilton. Mary and Peter went on to have ten children, seven sons and three daughters. Peter died in 1893 and Mary remained at Prestonholme for a further ten years before moving to Oakdene, Hamiton. Her son James and his family, fresh from a stint at the family property in Mexico, took up residence at Prestonholme. Peter and Mary attended the Hamilton Wesleyan Methodist Church in McIntyre Street and together were a driving force behind the church’s construction in 1862. Mary was involved with the Benevolent Ladies Society, auxiliaries, sewing groups, basically any church activity. Not only did Mary witness the construction of the first Wesleyan Methodist church in Hamilton, she was able to see the new church in Lonsdale Street (below). 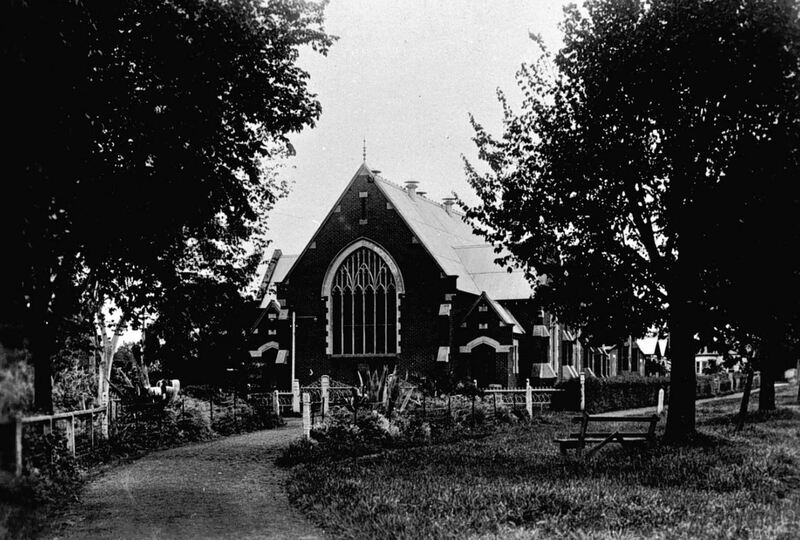 She was most enthusiastic about the new church and was given the honour of laying the foundation stone on 5 April 1913. Sadly she was in poor health at the time of the opening of the church on 5 October 1913 and was unable to attend. As a young girl, she lived in the unprepared period before extensive settlement, when the tracks had yet to be blazed and passage through the virgin bush had to be made by roadless routes and in vehicles for human transport of most primitive origin. Her life was contemporaneous with that of the pioneer Henty family. The areas of ownership of land were comparatively vast, and like her earlier friends she had the unique experience of viewing the gradual process of expansion of population in this large and fertile district. Mary was buried at Hamilton (Old) Cemetery with Peter. COLE, Nicholas – Died 22 November 1932 at Camperdown. Nicholas Cole was born in 1852 at West Cloven Hills Station near Darlington to Nicholas Cole and Martha Hodgson. His family had been on the property 1839. Nicholas went to school at Geelong Grammar. 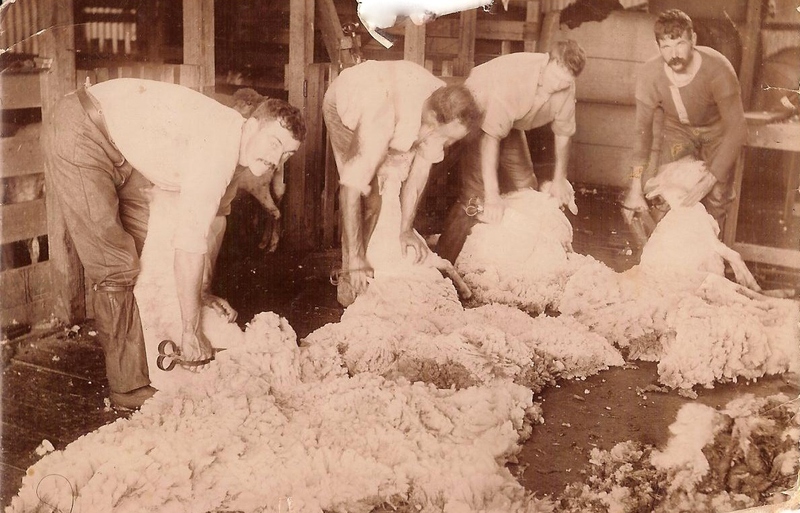 After the death of his father in 1879, Nicholas inherited the property and turned his attending to breeding Merinos, become one of the leading growers in the country. In 1885, Nicholas married Victoria Anderson of Gerangamete station. They went on to have a son and three daughters. In 1920, Victoria died suddenly from heart disease at the age of fifty-four. WEST CLOVEN HILLS HOMESTEAD. Image courtesy of the J.T. Collins Collection, La Trobe Picture Collection, State Library of Victoria. HEDDITCH, William Forward – Died 13 November 1939 at Bridgewater. William Hedditch was born at Lower Cape Bridgwater in 1857, the son of Richard Charlton Hedditch and Rachel Forward Read. He attended the Bridgewater School followed by Portland College. After school, William turned to dairy farming and was later director of the Portland and Bridgewater butter factories for forty years. In 1890, William married Marion Nunn Jones and they had two sons. William had an interest in local history and was a wealth of knowledge on the subject, writing many articles for the Portland Guardian on local history. He was buried at the Bridgewater Cemetery. WATT, Annie – Died 10 November 1952 at Coleraine. Annie Watt was born at Springvale in 1862. She married Robert Brown at the Hamilton Catholic Church in 1886, the wedding performed by Father Shanahan. Annie and Robert settled at Balmoral and in 1910 moved to Konongwootong South. In 1936, Robert retired from the farm and the Watts moved to Church Street, Coleraine At the time of her death, Annie was ninety and Robert was still alive along with six children, thirty grandchildren and twenty great-grandchildren. Robert died in 1957 aged ninety-six. This entry was posted in Pioneer Obituaries and tagged Cole, Dunbar, Hedditch, Hollard, Horan, Hull, Kirkwood, Lesser, Pearson, Watt. Bookmark the permalink.